The beginning of a new month always brings new changes. In our case the beginning of a new month brings to our dearest users another freebie. 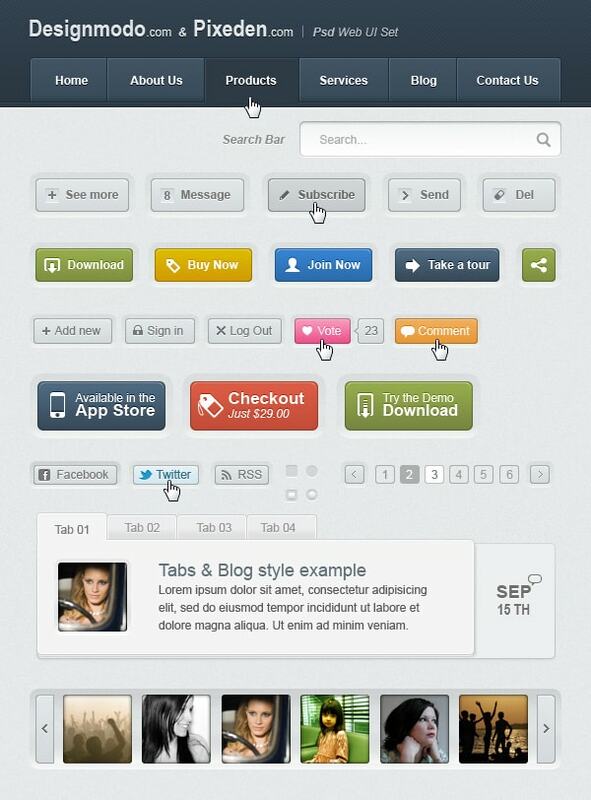 This time it’s about a cool Web User Interface Kit (Set) PSD, HTML + CSS + jQuery. If you still haven’t heard about them, you should definitely check out their website where you can find an amazing source of free premium design and web resources. As for the freebie we are sure it will come in handy for anyone interested in web design. Plus having another set of buttons and other cool elements while working on a website can never hurt. This might definitely help you if you have some kind of a creative crisis, or are out of time and ideas to actually design the elements on your website yourself. We decided to help you out with that and we hope you will love them as we did! PSD Web UI Set is fully layered, web elements have hover and normal states, Web UI Elements Kit available in PSD, HTML + CSS + jQuery formats. Colors of buttons can easily be changed according to user taste and needs. Enjoy and let us know what you think. Format: PSD, HTML + CSS + jQuery. Thanks for this awesome UI Set :) keep up the good work.